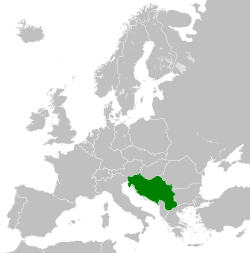 The Socialist Federal Republic o Yugoslavia in 1989. ^ Full name in the Serbo-Croatie an Macedonie leids, written in the Laitin alphabet (see Name section for details). ^ Full name in Serbo-Croatie an Macedonie, written in Cyrillic. ^ Full name in the Slovene leid (Slovene anly uises Laitin). ^ Thare wis no proclaimed offeecial leid at federal level. ^ Serbo-Croatie wis a de facto offeecial leid. Its regional varieties war recognized an made offeecial in thair respective republics: as Serbian in SR Serbie an SR Montenegro, Croatie in SR Croatie an as Bosnie, Serbie an Croatie in SR Bosnie an Herzegovinae. ^ Offeecial in SR Macedonie. ^ Offeecial in SR Slovenie. The Socialist Federal Republic o Yugoslavie (SFR Yugoslavie or SFRY) wis the Yugoslav state that existit frae its foondation in the eftermath o Warld War II till its dissolution in 1992 amid the Yugoslav Wars. This page wis last eeditit on 17 Februar 2019, at 20:24.